Le Grand Chef became the top film of the 4th quater of 2007 when it surpassed the 2.5 million mark in its first month, and went on to accumulate 2.9 million viewers since last weekend. The film is closing in on the 3 million mark, which it should easily surpass, according to an earlier prediction by its production company ShowEast. The adaptation of HEO Young-man’s manwha (comparable to Japanese manga and Chinese manwha) proved to be not only attractive to young women – <?xml:namespace prefix = st1 ns = "urn:schemas-microsoft-com:office:smarttags" />Korea’s main film audience – but also to males from several generations, making it a suitable family film. Last year’s blockbuster Tazza: The High Rollers is also an adaptation of a HEO’s manwha. JEON Yun-su’s Le Grand Chef stars LIM Won-hee and KIM Gang-woo, and is about a cooking contest between rival chef families both related to former royal chefs. 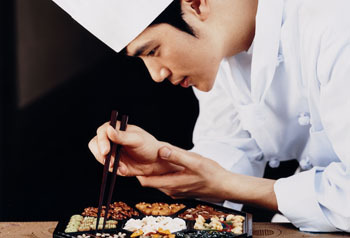 At stake is a legendary historical cooking knife, once used by the last Korean royal chef in the Chosun dynasty. Le Grand Chef contributed to the increased cinema attendance numbers in November. According to leading cinema chain CJ/CGV, 10% more viewers visited cinemas in November compared to October. CJ/CGV recorded 95.7 million guests in November. In Seoul the increase was 12% compared to October and box office numbers also surpassed November 2006 with 12%. However, the market share of domestic films dropped to 58% in November, down 7.5% from October. Seven Korean films featured in the top ten in October. November counted five domestic entrances in the top ten. Following 2006’s record-breaking year, the Korean market share in the first eleven months of 2006 is down to 52% from last year’s 65.5%. Still, the Korean film market remains one of the few global markets where domestic films account for over 50%, even during a slump year.